An agreement for the development of a website is nothing more than a contract for a specific work concluded between the parties, which can be businesses or even individuals. It is worth concentrating on elements of such a document which characterize it in relation to more general contracts. In addition to specifying the parties, the subject matter of the agreement and customary contractual provisions, the main part of the website development agreement needs to clarify certain elements due to the nature of the processes and activities of an interactive agency. One part of the agreement which requires a lot of attention during its preparation is a list of definitions. Due to the technological nature of the Internet projects, such a list is necessary. A clear explanation of terms that will appear in later parts of the agreement will allow both sides to understand them the same way. This will minimize the likelihood of confusion in the implementation phase of the project. If it is necessary to exercise the rights under the agreement, it will facilitate court proceedings – if the parties agreed on a specific definition of a particular term, the scope for a possible interpretation is minimal. The concepts, the meaning of which should be described in the agreement in particular are, for example, a website or a web app (subject of the agreement), licensed elements, dedicated elements, open source. Issues related to copyright are among the key elements that should be protected by appropriate provisions of the agreement. Protection is provided for works created for the client, including graphic designs and code written for the client’s website. Under the agreement copyrights are usually transferred from the author to the client. The agreement should also provide protection for the rights to use a licence for non-dedicated solutions such as a CMS. In this case, the licence is typically granted for an indefinite period but in certain cases you can find strictly defined licensing periods. When developing a website, Open Source elements are often used, e.g. ready-made scripts and icons. They should be listed in the agreement. Due to the specific nature of their business, interactive agencies use the services of freelancers and other subcontractors. Moreover, it is common to be working with regular contributors who run one-man businesses instead of working with them on the basis of a fixed-term employment contract. Due to this, third parties take part in the process of implementing the agreement. The client should ensure that the agreement contains a provision clearly stating that the contractor who is party to the agreement shall be fully liable for the actions or omissions of his or her subcontractors. It would be beneficial for the agency to take care of its safety by signing appropriate contracts with the subcontractors. In this case, the key act is the signing of a non-disclosure agreement (NDA). This position exists in every agreement. When it comes to creating websites, there are some specific rules for this industry. The agency requesting a down payment is a normal practice. It usually equals 20% of the contract’s value. In the cases of simpler website, after they are delivered and approved by the employer, an invoice for the remaining 80% of the amount is issued. When dealing with complex projects, consisting of several stages, the schedule may provide for partial payments after the completion of subsequent parts of the website. As in any type of such document, the website development agreement can also include provisions on liquidated damages. They may force both parties to act in a specific way. In most cases, the penalties are specified in amounts of money or a percentage of a set value. They can be provided for a case of a failure to meet the website delivery deadline, one of the parties breaking the provisions concerning confidentiality (unless a separate agreement has been signed in this case – NDA) or one of the signatories withdrawing from the agreement on principles contrary to the relevant provisions of the agreement. The most common penalty for an agency is the penalty for delays in the delivery of a website operating in accordance with the arrangements. In such a case, damages corresponding to the established fraction (e.g. 1%) of remuneration for each working day of delay are being charged. The best form of protecting confidential information is a non-disclosure agreement (NDA). If the parties agree to include non-disclosure provisions in the performance agreement, they are free to do so. While composing paragraphs on this important issue, it is worth keeping in mind that it is possible that both parties will provide each other with information, that they should get defined and penalties for breaking the provisions should be specified. You can read more about confidentiality issues in our text about non-disclosure agreements. While it is clear that the people signing the contract must have the appropriate permissions to represent the entity, it is also important not to forget to list in the agreement the people who will be responsible for its implementation. This applies to making decisions and – above all – approving the completed elements of the website and the whole website at the end of the works. It is extremely important because it helps to avoid a situation in which you have to go back to the earlier stages of the works in subsequent stages because the ordering party challenges the competence or rights of the person that made the approval. Ensuring this provision appears in the agreement provides peace of mind during the execution of the order and improves communication between the parties. The interactive agency not only provides the website but also pledges that it will work flawlessly. The warranty for the website usually lasts 12 months. This is the usual period that has also been defined in the law of the EU Member States. During this period all defects are removed at the expense of the provider. In the event of any external meddling with the website (by the client or by a third party appointed by the client), the warranty usually expires. The contractor, who also provides maintenance services for the website, can assure its availability at a particular level (percentage uptime per month), which is reflected in the service level agreement (SLA) which may also be an annex to the performance agreement. Both warranty and SLA constitute elements that increase the attractiveness of the agency’s offer. A performance agreement can be constructed in a universal manner so that the more detailed elements regarding specific projects can be prepared in the form of annexes. They will provide a tool for those involved in the project on the client and the agency side in the process of creating the website, when putting it into service and during its operation. A well prepared agreement can be used for subsequent projects, subject only to cosmetic changes. Annexes allow for matching documentation to the needs of individual projects. This annex will provide a kind of action plan for people implementing the project. Functional specification is a description prepared by the designer of the website. 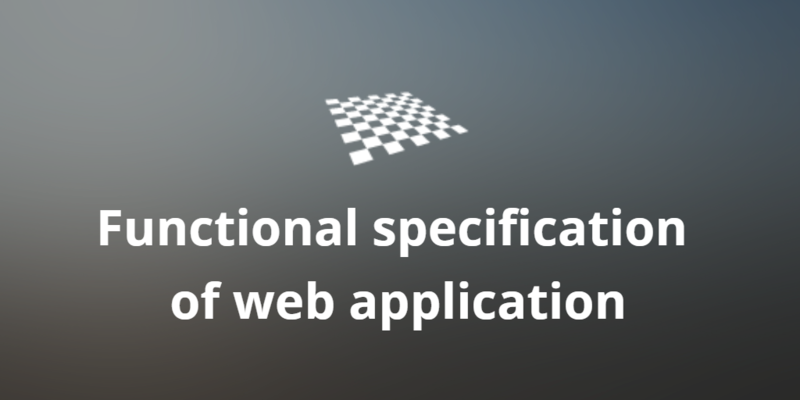 Building a complex web solutions without a well-prepared functional specification is, in practice, impossible. For simple websites, including a general description of the structure and functionality in the agreement will be sufficient. You can learn more about what functional specification is and how to create it in the entry devoted to it. This document protects the interests of both parties. It includes the elements from the presence or functionality of which the service provider will have to account for in front of the client. It’s beneficial if the template of the acceptance form with the list of required elements and a space for notes and signatures of the people responsible for the project constitutes an annex to the agreement. When creating a website you need to stick to a specific sequence of actions. After agreeing on it, a detailed schedule is being prepared. It serves both parties. It allows the ordering party to control the progress and provides the agency with peace at various stages of the project. One of the key aspects – recognized in the schedule for the benefit of both parties – should be to limit the time that the client will have to send the necessary materials and accept the elements of the target website provided by the agency. Reducing the time to provide comments or acceptance facilitates work. Failure to meet the deadline should – by virtue of a relevant provision of the agreement – result in presuming the given element to be accepted (the “accepted” status in the schedule). The number of iterations of revisions that the client can submit should also be limited. All of this is to avoid shifting the subsequent stages and the final deadline for the completion of the project by the delay. The professionals that the agencies hire aren’t complaining about the lack of work. It may, therefore, turn out that an expert whose time was booked won’t be available again for a long time. Performance agreement is a document that, from the point of view of both the parties, should be refined in every detail. Its provisions motivate the parties to meet their obligations. On the other hand, they give the feeling that in the event of problems in the execution process and once the website is operational, the agreement will be a point of support when you need to exercise your rights. The content of the first agreement – which will be later reused after minor adjustment – should be prepared from scratch, working with a lawyer, so that all of its provisions are tailored to the specifics of our business. However, sometimes a model may prove useful – be a starting point. Thus, below you will find a template of such an agreement. All you need to do to be able to download it is to share this post using the buttons located below. ← How to choose the best domain for a website?